Rallies are also held elsewhere in Maine, including Brunswick, Augusta, Farmington, Bangor and Bar Harbor. 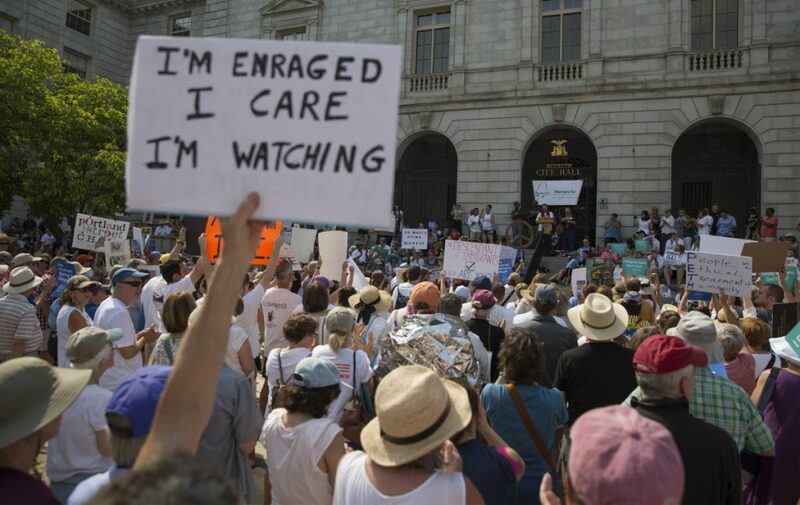 Hoisting signs that read “Impeach the Bully,” “Keep Families Together” and “No Human Being Is Illegal,” a crowd of 2,000 protesters packed in front of Portland City Hall made it clear Saturday afternoon what they think of the government’s treatment of immigrants. The crowd chanted enthusiastically, sang and applauded wildly while listening to a dozen speakers over two hours in 80-degree heat. 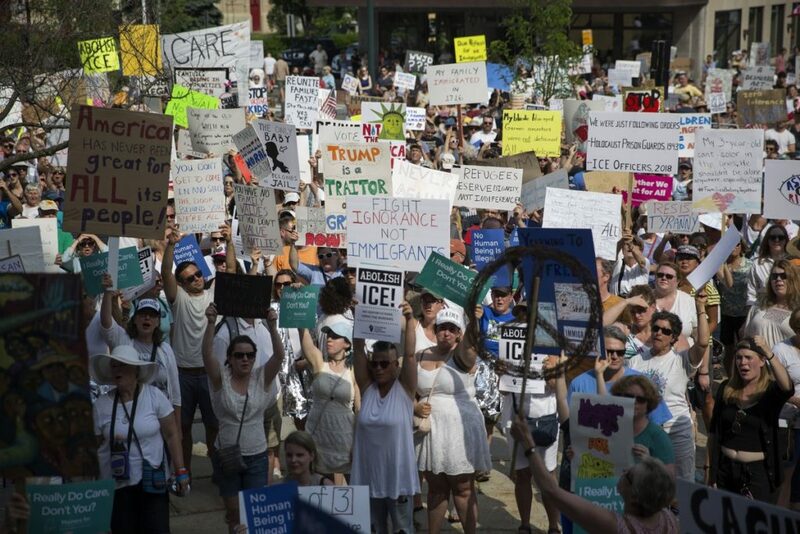 The event was one of more than 600 “Families Belong Together” protests and marches held in all 50 states Saturday, a coordinated effort to bring attention to President Trump’s immigration policies, specifically the practice of separating immigrant children from their parents at the southern border. Protests were also held elsewhere in Maine, including Brunswick, Augusta, Farmington, Bangor and Bar Harbor. In Portland, speakers implored the crowd to be active in politics and, specifically, to vote in the November midterm elections, as a way to try to force the government to treat immigrants and all minorities more fairly. He said seeing news reports in recent months of children being separated from their parents made him “mad as hell.” He asked the crowd if they, too, were mad as hell, and the answer was a resounding yes. The crowd was attentive and enthusiastic during the rally, and respectful of one another in the hot and sticky conditions. The crowd also filled two blocks of Congress Street, which was closed by police. Many of the signs, and some of the speakers, called for the abolishment of the federal Immigration and Customs Enforcement agency, known as ICE, which enforces immigration policies. Many people who came said that the policy of separating families was just the latest action by Trump that proves he and his top officials often ignore human rights. Several talked of Trump’s attempts to ban Muslims from the United States as an example. The government’s separation practice came to light in early May when Attorney General Jeff Sessions announced that the departments of Justice and Homeland Security would prosecute everyone who crosses the border illegally — the so-called “zero tolerance” policy. Because children cannot be held in jails with their parents, the policy led to some 2,300 children being separated from their parents at the country’s southern border between May 5 and June 9. On June 20, in the face of public and political pressure, Trump signed an executive order to end the separation of families, by detaining parents and children together. 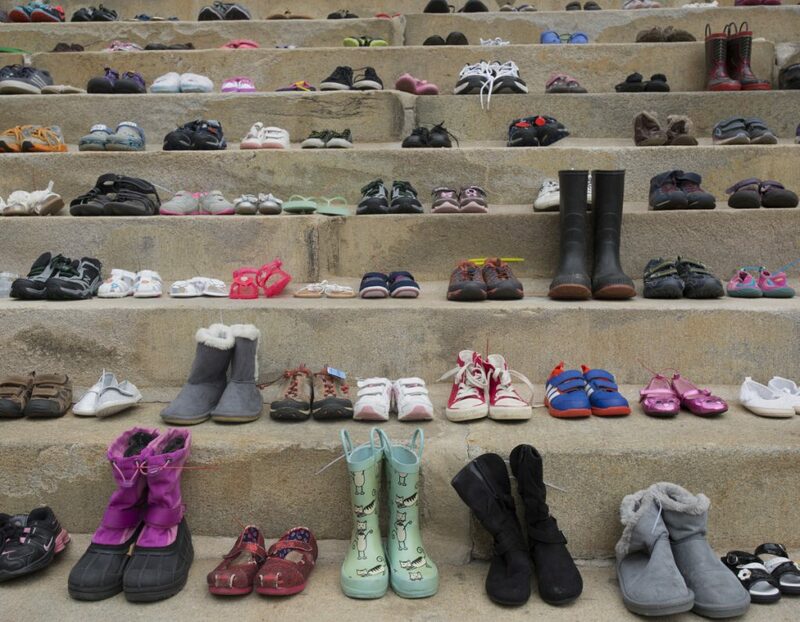 The order did not address the plight of the children who had already been held separately. On Tuesday, a federal judge in California ordered immigration authorities to reunite separated families on the border within 30 days. 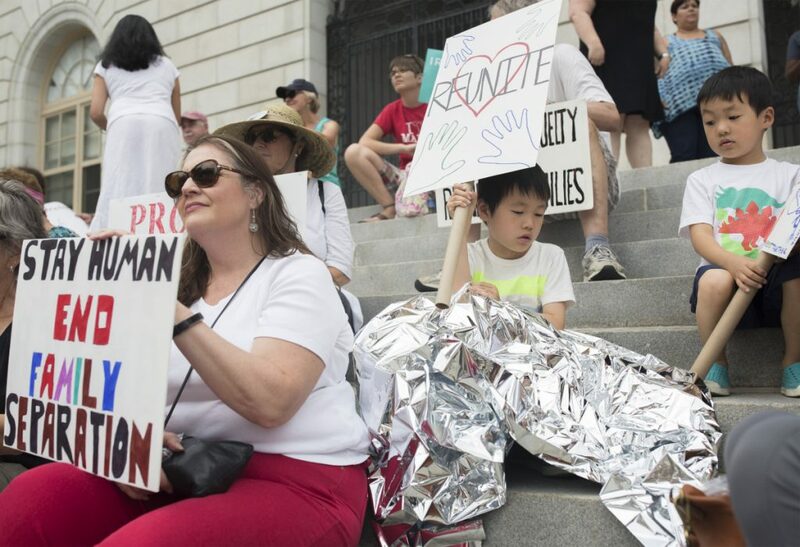 Julie Krasne, 59, of Freeport, was one of the dozens of people who wrapped themselves in shiny foil-like blankets, similar to those seen being given to children separated from their parents. 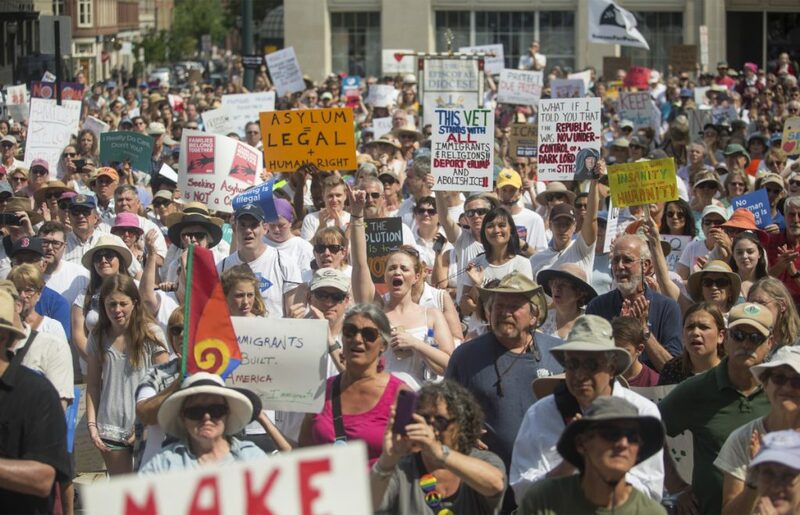 Portland’s rally was hosted by more than a dozen local social action groups, including Mainers for Accountable Leadership, the Maine Immigrants’ Rights Coalition, the American Civil Liberties Union of of Maine, The Greater Portland Immigrant Welcome Center, and the Maine NAACP. Among the speakers were representatives of those groups, as well as immigrants living in Maine. 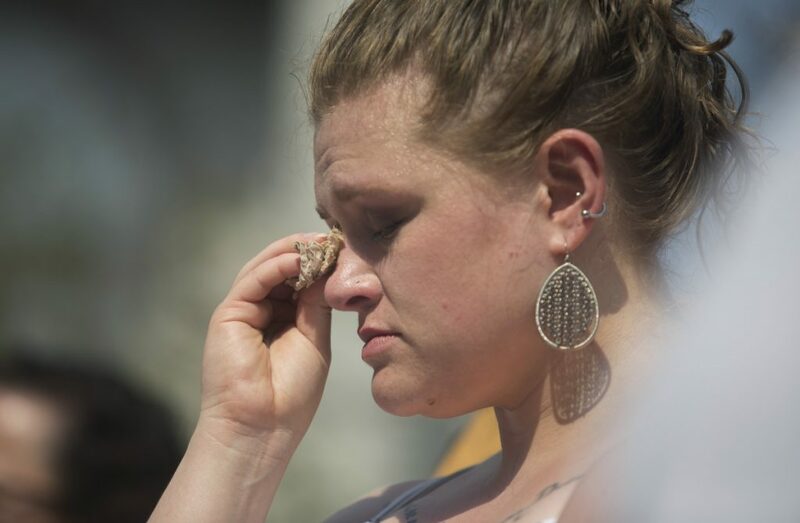 In Augusta, an estimated 1,000 people attended a protest Saturday on State Street in front of the State House. In Farmington, about 200 people gathered on Main Street for a protest. Organizers said one aim was to bring awareness to elected officials, including U.S. Rep. Bruce Poliquin, R–2nd District, about opposition to Trump’s immigration policies. In Brunswick on Saturday, U.S. Sen. Angus King addressed the 250 or so people gathered for a protest on the Brunswick Town Mall. 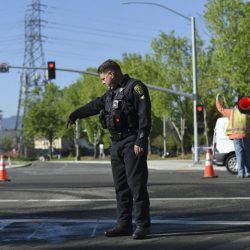 Staff Writers Jessica Lowell of the Kennebec Journal, Rachel Ohm of the Morning Sentinel and Chris Quattrucci of The Times Record contributed to this report, as did The Associated Press.